I've been using SmartFTP for who knows how long because it's been free and easy to use. I'd been too lazy to look into anything else. Now that it's NOT free, I switched to WinSCP. I added Notepad++ as an external editor. Is there a way to fix the ridiculous abundance of line breaks? How do you open the file from remote browser? Double-click? Explicit open? Explicit edit? If double-click, what is your configured on-double-click action? Edit/Open? In what editor/application does the file open? What protocol are you using? It opens like that regardless of how I open it. Double click/open/edit. In the options I set Notepad++ as the default editor. Protocol is standard FTP. Unfortunately I'm not able to reproduce the problem. Do you know why EOL does the file stored on server have? If not, can you download the file to local machine (make sure to use binary transfer mode), ZIP it and mail it to me? Do you have editor option Force text transfer mode... enabled or disabled for notepad++? I have upgraded from 4.0.0 to both 4.1.5 and 4.1.6. In version 4.0.0 the data transferred OK between 2 x Win32 PC's, with both the source Text File and the Destination Text file being the same size. Using both 4.1.5 and 4.1.6 I end up with a different size Text file at the destination and have found that every CR+LF has been changed to CR+CR+LF. I hope this helps and I will change back to Vn 4.0.0 - Good product thanks for allowing me to use it. I think I have found the option to make everything a "Binary" transfer and it is now working correctly. 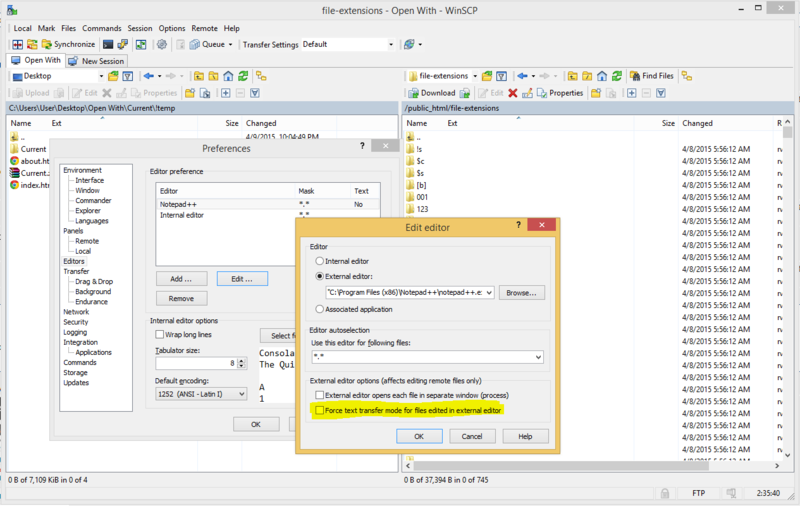 WinSCP -> Login -> Preferences -> Preferences Button -> Transfer -> Binary(archives, doc). What protocol are you using? There has been change to handling of ascii transfers in 4.1.1 with FTP protocol. If you are connecting to Windows server, make sure you set Window EOL characters on Environment tab. I was the original poster of this topic, and I'd like to say that changing the transfer mode to binary fixed the problem. My server is linux-based, and the files are UTF-8. I'm really glad I got around to checking this topic again. I haven't had the time lately to deal with this until now. I really like everything else about WinSCP. 2) Open "Find and Replace" window (check "Extended" under "Search Mode"),then type \r\n in first line, and \n in the second and click "Replace all" and SAVE. From now, they may be opened normally. i am using 'UTF-8' instead of 'latin' as default encoding in the editors preferences, that seems resolve the problems for me. Other than you're posting in a very old topic, what you said is basically a conversion of EOL(end of line) from Windows format to Unix. This can be done automatically from Edit menu/EOL Conversion inside Np++. Since this issue is still relevant in 2015, I am replying to this thread with the same screenshot that I posted in the other thread (both threads are at the top of Google's search results for this issue).